Japan is awesome! The people are super friendly, the food is fantastic, and it is a developed country where you feel like you are in a different world. We didn’t know if our journey was going to take us to Japan but we are so glad that we made it work and my brother Jack was able to join us. 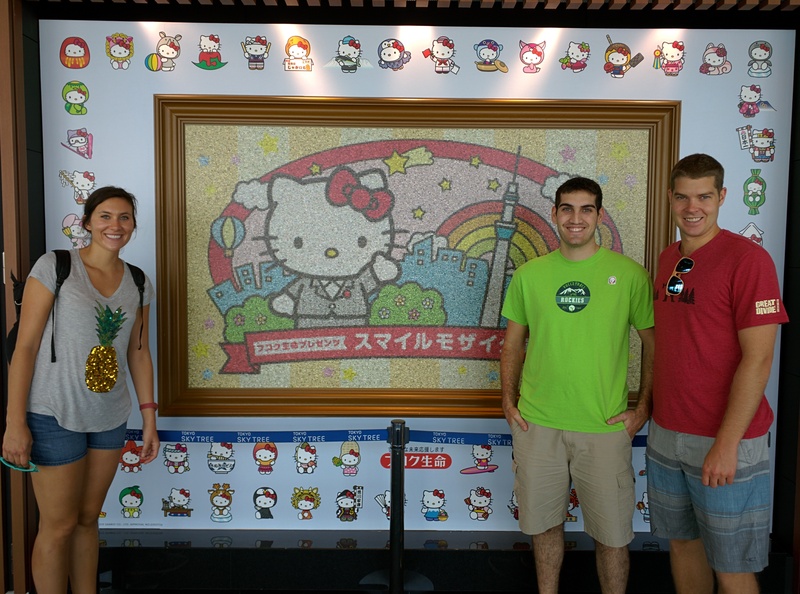 We spent a total of 12 days in Japan and visited Tokyo, Hiroshima, and Kyoto. The only issue we had was it rained almost every day in Tokyo because a tropical storm was passing through but other than that the trip was great. 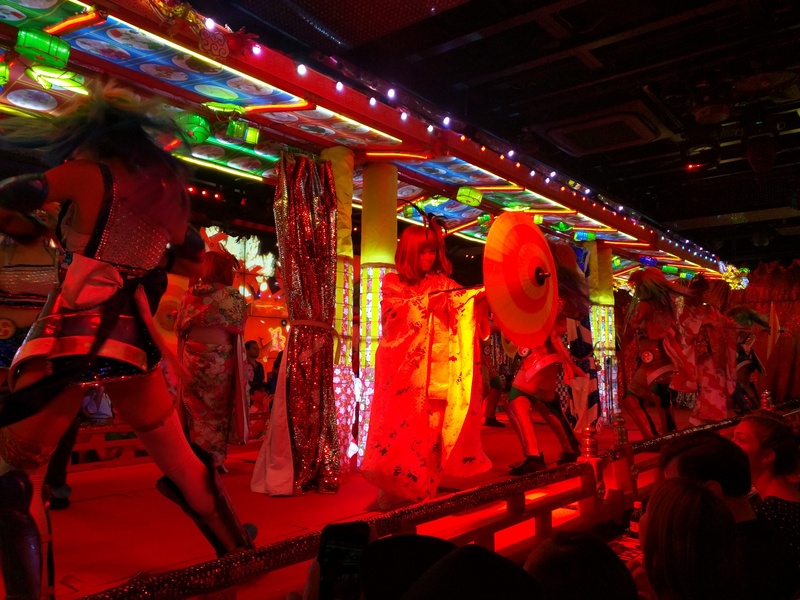 The rain wasn’t the end of the world because there are a lot of indoor activities in Tokyo. 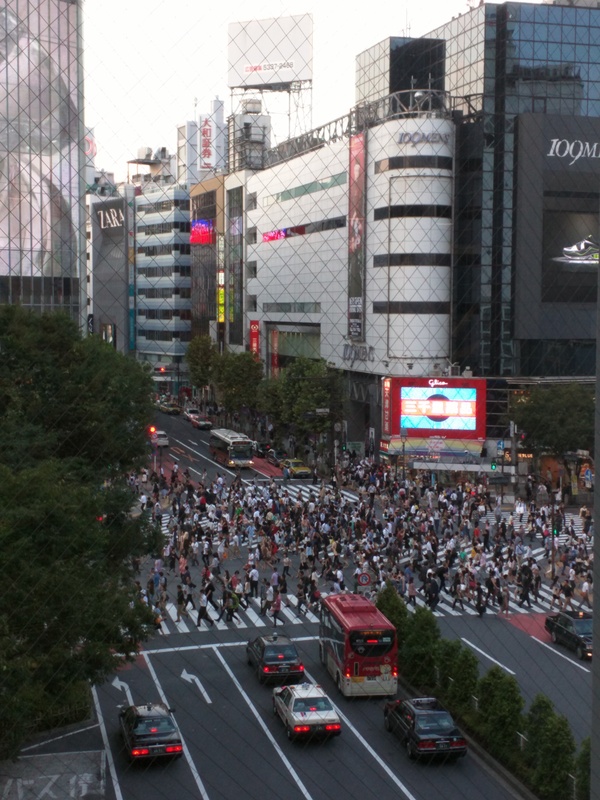 Busiest street crossing in the world. 150 people/second at rush hour. We felt like we really did a lot while we were in Tokyo. We went to the neighborhood of Akihabra also known as “nerd city” where there are a ton of arcade games, nerds, and buildings filled with magic cards, action figures, and manga. 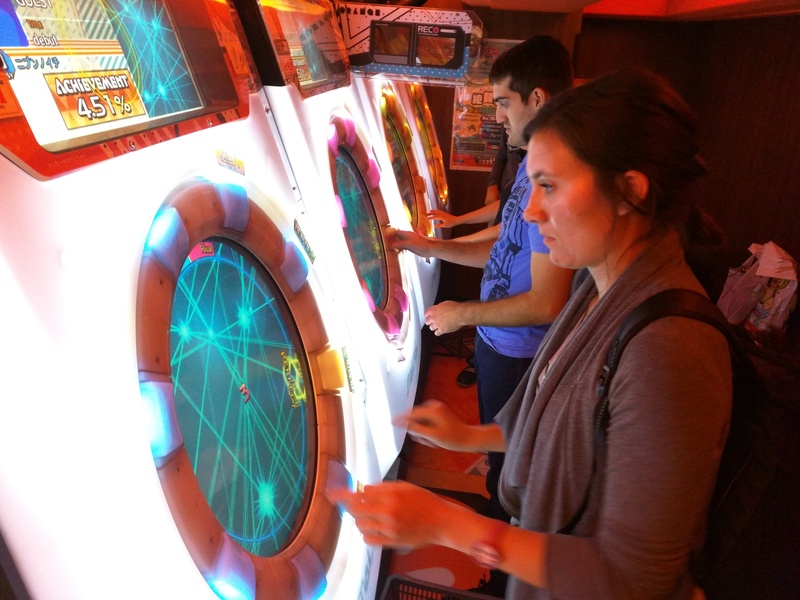 We of course had to play some arcade games and found an awesome game that was basically dance dance revolution for your hands. We also went to the Harajuku neighborhood in order to see the “Harajuku Girls” and other interesting characters but I think we either missed them or none of them were dressed up during the day. And you can’t leave Japan without visiting at least one karaoke bar. We only karaoked for a half hour because those places are pricey but we did our best and crushed out some American songs including Top Gun’s Danger Zone. Akihabra rain getting our gaming on. So serious. In the zone gaming. 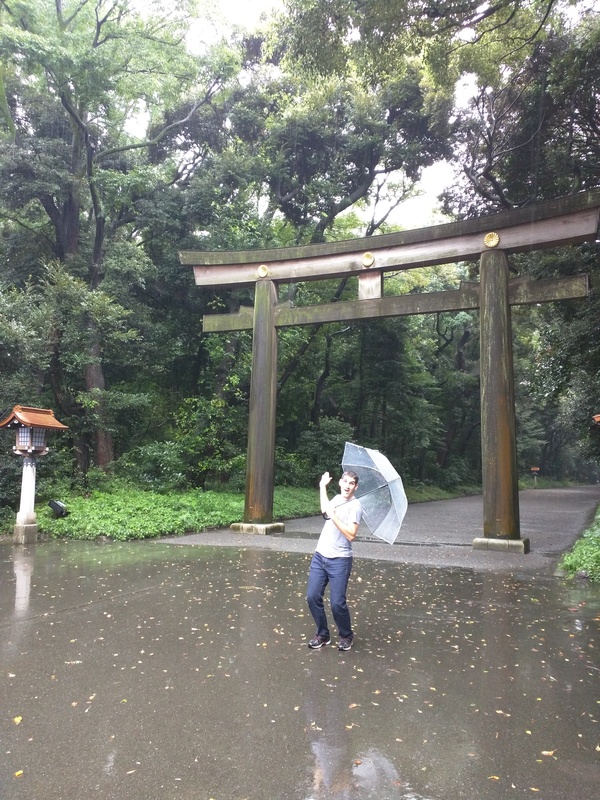 Japan is known for its amazing shrines and temples so we made sure that we hit a few while in Tokyo. We visited the Sensō-ji Buddhist temple that includes the Thunder Gate which is an icon of Tokyo. We also visited the Meiji Shinto shrine and witnessed a wedding going on. The Meiji shrine has these huge gates that mark the entrance to the shrine. 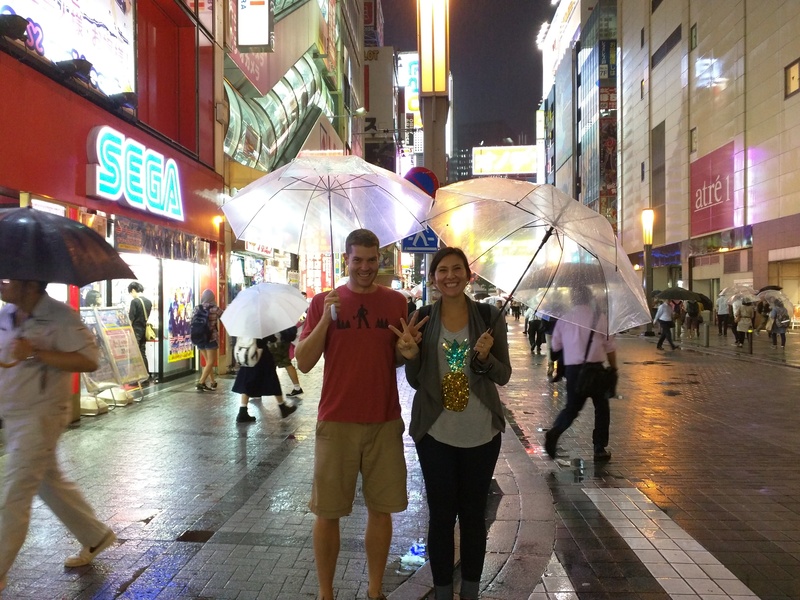 Since the rain was putting a damper on our outdoor activities we decided to see a few shows while in Tokyo. 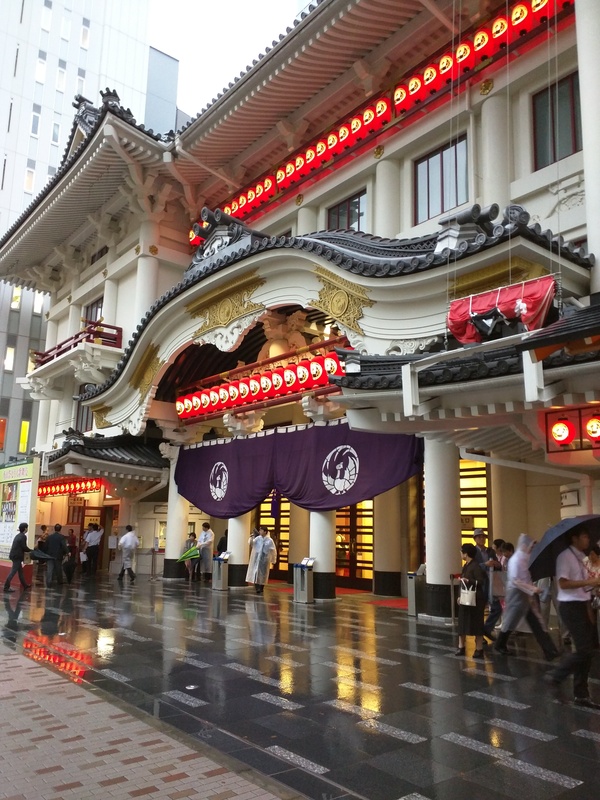 We went to the Kabuki theater which is a traditional Japanese theater where there actors are only men so the men end up playing women which can be pretty funny. We were lucky that they allow you to buy tickets to only one act because by the end of the act we were about done with Kabuki theater and pretty much falling asleep. The other show we booked was the Robot show. If you guys have seen Anthony Bourdain’s Tokyo episode he goes to this show and raves about it. We also thought it was pretty amazing. 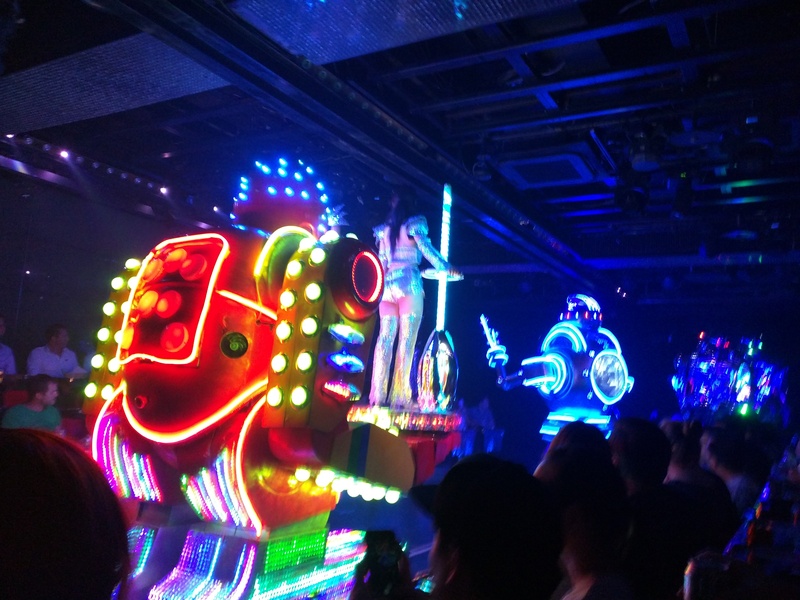 Its giant robots of snakes, sharks, normal robots, loud music, and scantily clad ladies. So all the makings for an epic show. You also are not allowed to stand up during the acts because you might get hit in the head by one of the robots. Once the rain cleared we went to the top of the Tokyo Sky Tree which is the 2nd tallest building in the world and has an observation deck where you can really see how huge Tokyo is. The city is massive. 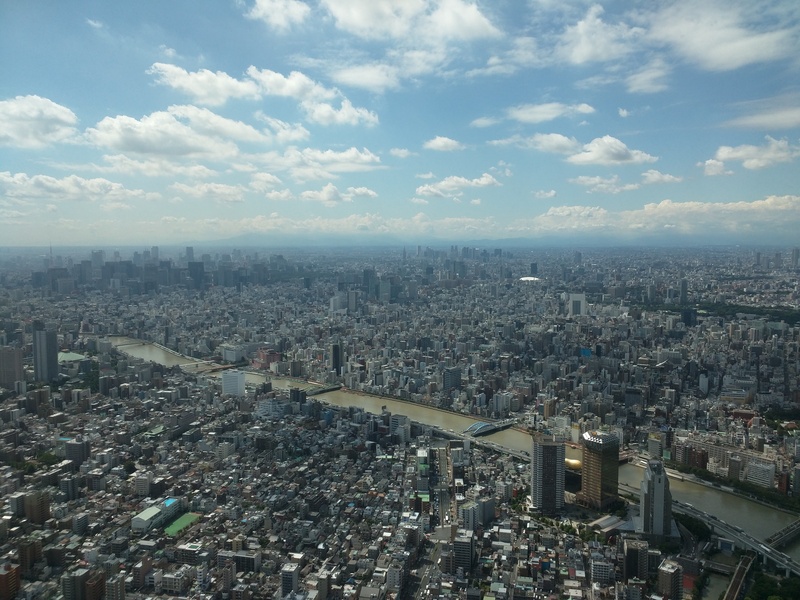 View of Tokyo from Tokyo SkyTree. Now on to the good part..all the delicious food! That is one thing we are going to miss when we are back in the states bomb Japanese food oh and the vending machines. There are vending machines every 20 feet or so with water, soda, coffee and a lot of the restaurants have vending machines to order your food. You put the money in the machine, select what you would like to order, and out comes a ticket that you hand in when you get inside. This method is genius! Most ramen shops order like this so you can just check out the pictures of what you want and push a button then voila ramen, fried chicken, or gyoza (or all three). That is another thing I need to mention, the Japanese know how to fry a chicken and I had some of the best fried chicken of my life in Japan. 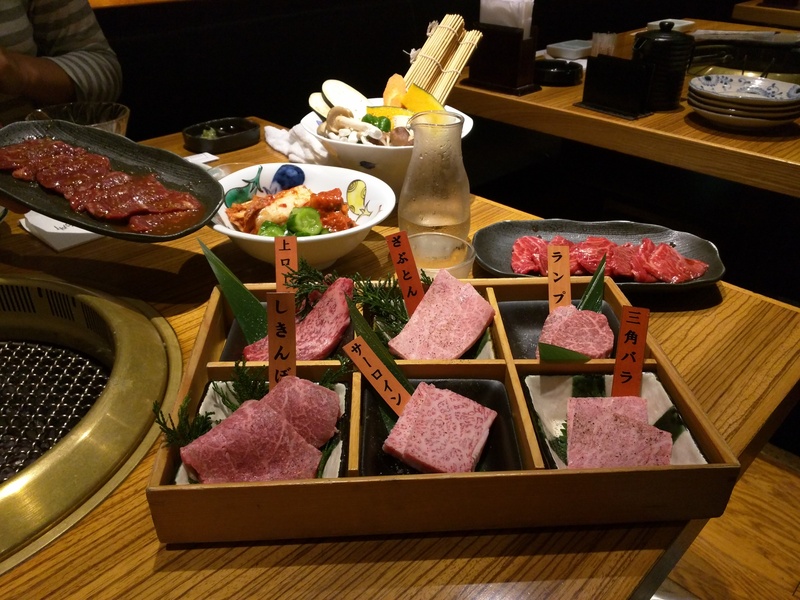 One of the other epic meals we had was a Japanese BBQ joint where you grill your own meat at the table. The reason it was so epic was because of the quality of the beef. They had a selection of 6 types of Kobe beef that was unreal. These beef just melted in your mouth. Amazing. That is one of a ton of things the Japanese have figured out is doing something right and the high quality of food. Check out the marbling on that bomb Kobe beef. nom noms. 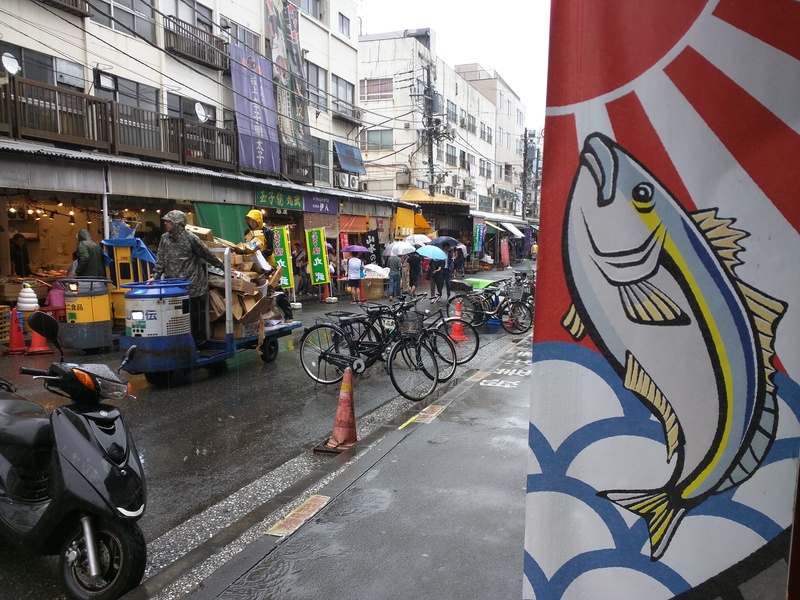 And you can’t leave Tokyo without visiting the Tsukiji Fish Market. We were too lazy to get up that early and see the actual auction happening (we watched a you tube video instead) but we headed to the market for breakfast and had some delicious breakfast sushi. 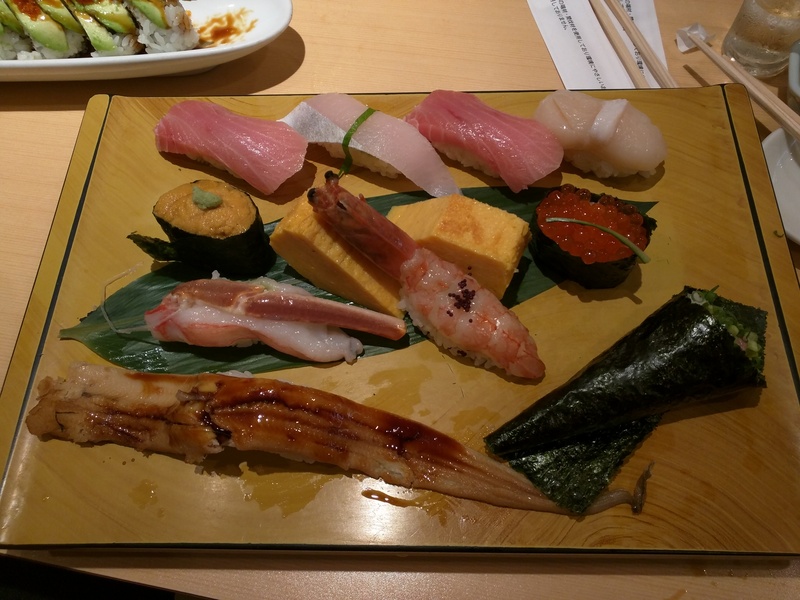 We also had arc clam for the first time which ended up being pretty good. 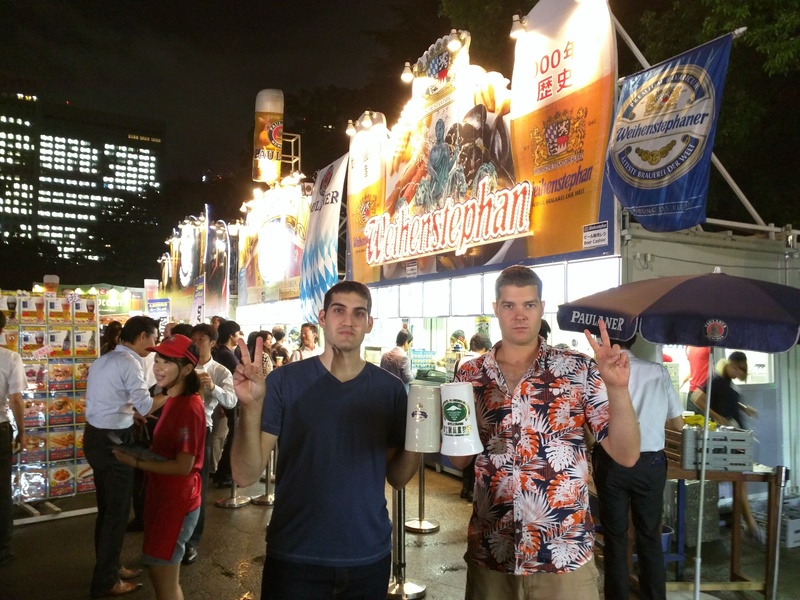 Randomly we ended up going to Tokyo’s Oktoberfest. Yes you read correctly we were at a Japanese Oktoberfest. Since we were missing Oktoberfest in Breckenridge we thought this would suffice and make it 7 years in a row we have been at Oktoberfest! The Tokyo Oktoberfest doesn’t really compare with the Breckenridge version but did have way more German beers that we were able to try. Random Tokyo Oktoberfest. Who knew we would find Oktoberfest in Japan. All in all Tokyo was amazing! Now off to Hiroshima and a ryokan/onsen in Kyoto.